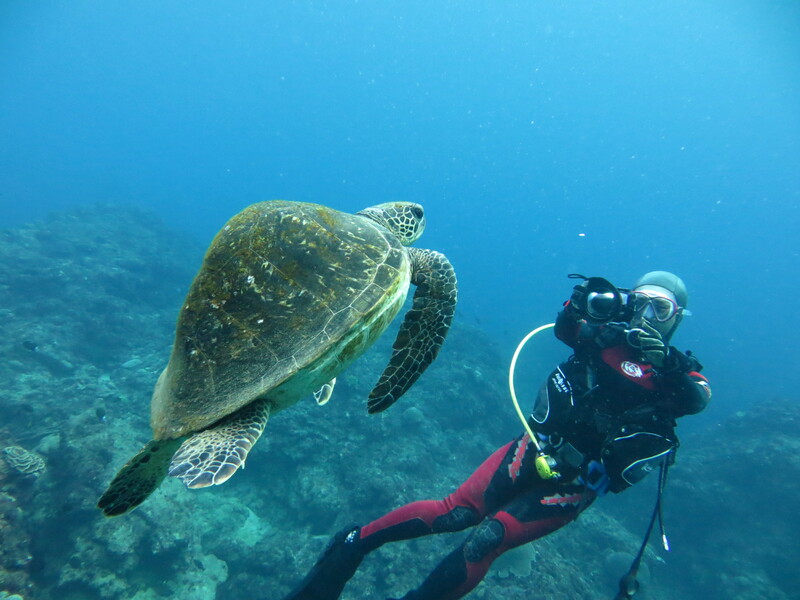 Keep your eyes and ears peeled and you might just spot a turtle or hear the cry of a whale as you dive off Tokunoshima’s subtropical seas. Spanning 25km from north to south and 18km from west to east, this island, with a population of about 30,000, is not well known and often overlooked in favour of other destinations like Okinawa, but its natural underwater beauty really stands out – a prime example of Japan’s volcanic geology where huge flat rocks and coral lie in abundance. 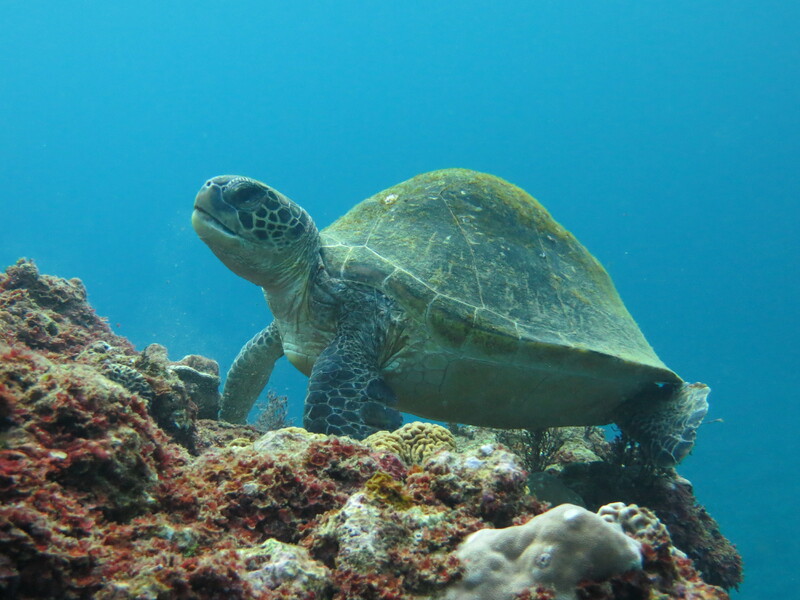 Turtles are often spotted during dives and in February whales come close to the island, filling the ocean with their cries. Here are some of the sites I visited during my trip. Senma Bay is the island’s main spot for shore dives and most beginner-friendly although the bay is rocky and extra care is required during entry if conditions are slightly rough. 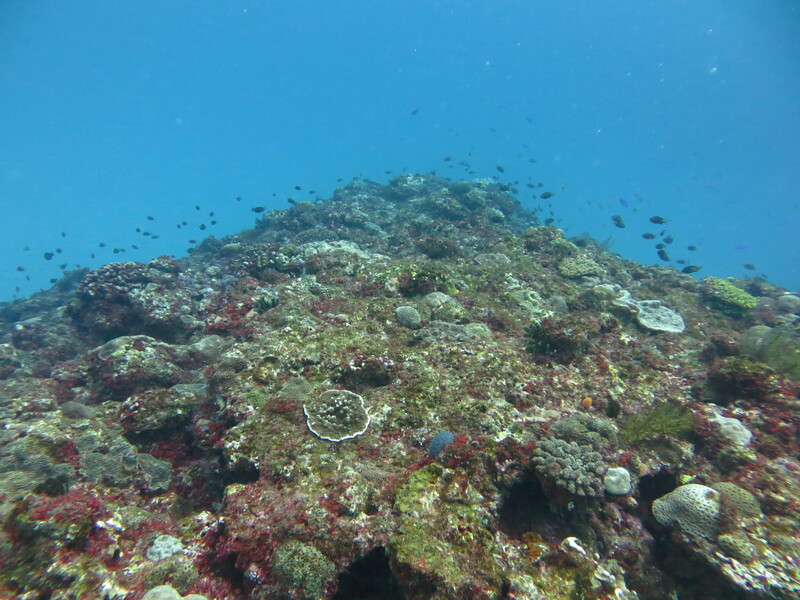 The gradual descent begins over a flat area of rock and table coral at about 4m. An array of tiny colourful fish remains on guard, hiding cautiously and flitting in and out of the tiny dark holes. Soon this scene disappears and below is a sharp drop with a sandy bottom in the distance at 16-17m. 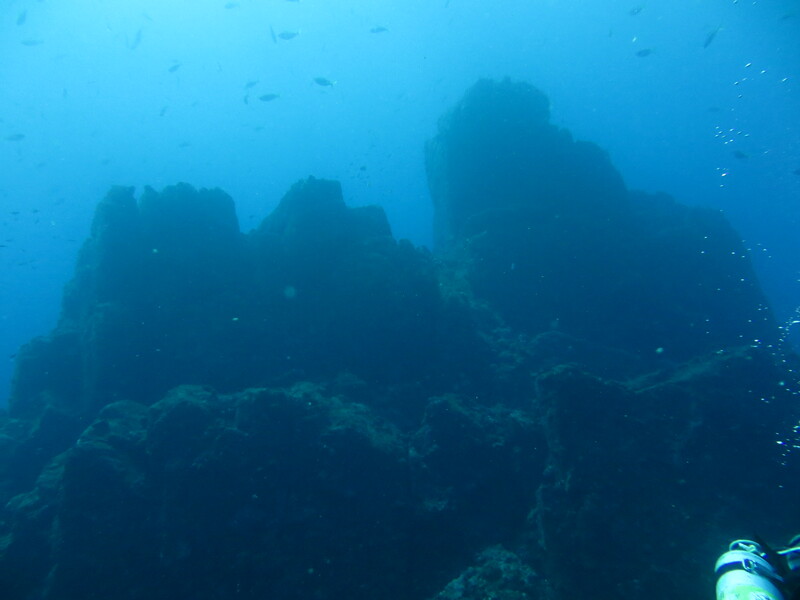 The journey down there is a nice opportunity to see in more detail Tokunoshima’s rough and rugged underwater terrain and its inhabitants – linear blennies, parrot fish, turtles, semi circle angel fish and Moorish Idols that graze against the walls. 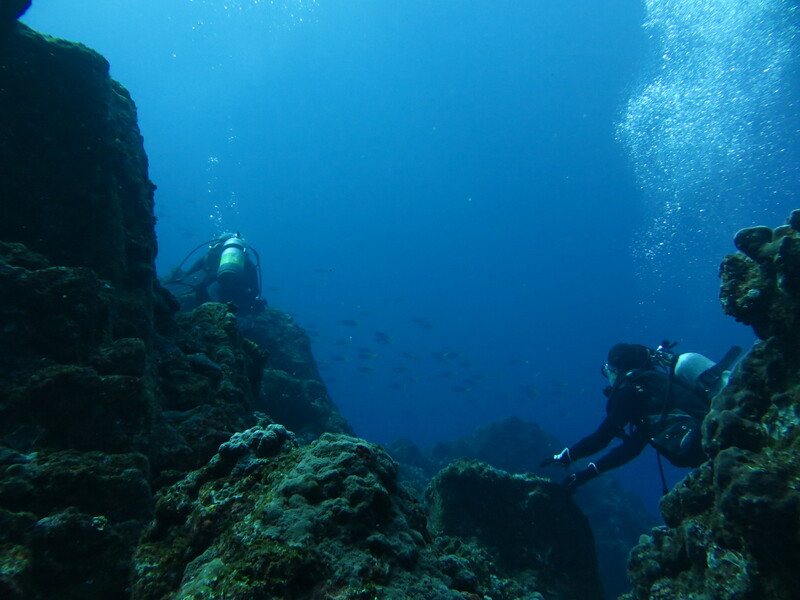 The rock formations are huge, rising above for miles and miles, full of small openings, cracks, crevices and concealed spots, ideal for divers who like tunnels, arches and concealed areas. 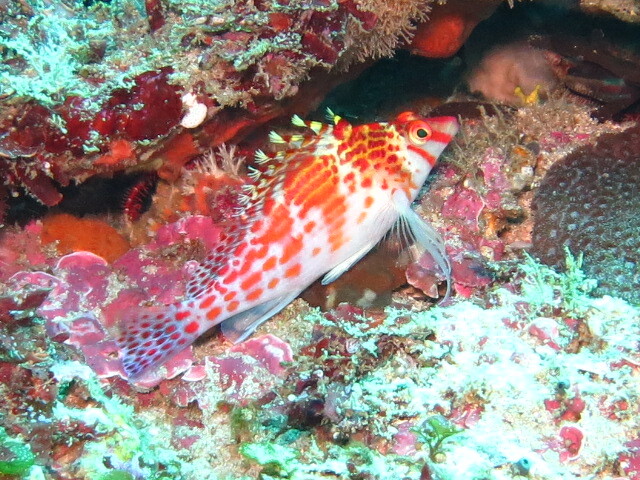 Swimming through narrow passageways with sandy bottoms is a great way to enjoy the slow ascent but don’t forget a torch as you never know where the next lionfish or nudibranch might be hiding. The journey around Blue Hole Oki begins with a backward roll and an immediate descent down an anchor rope to around 10m. A carpet of rock and flat coral lies below and deeper down, turns into bigger rocky ledges and formations with sandy areas in between. Some of these are cliff-like with ridges and are ideal environments for turtles or squid to rest in and hide away. 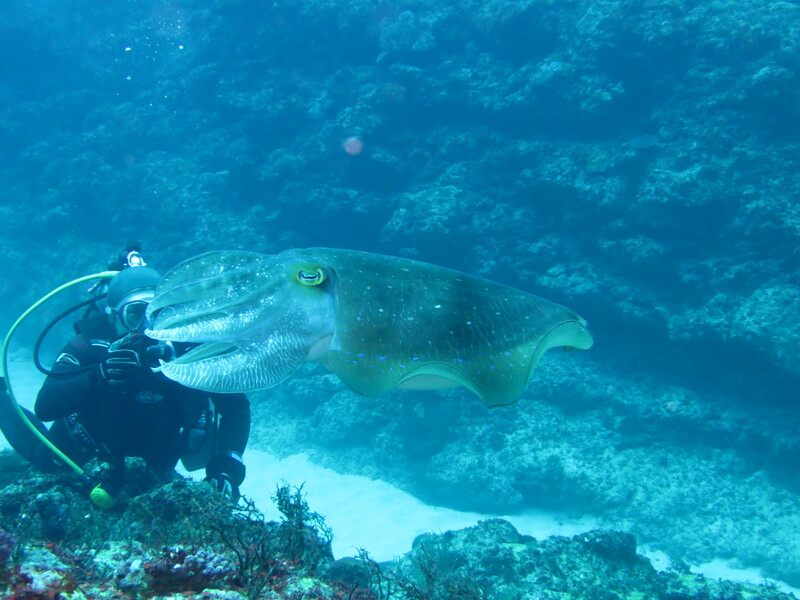 We were lucky enough to meet a big healthy-looking cuttlefish gliding past in his own little world. Following the rocks further down to around 24m, we came to a cluster of medium-sized rocks and watched a school of bright blue-striped snappers that had set up home. Close by, trumpet fish drifted by here and there, a white tip reef shark popped up to say hello and the odd sea snake glided curiously towards us. The ascent is a journey past some colossal boulders large enough to carry various coral species such as brain and table coral and shield lion fish, nudibranchs and yellowfin goatfish. San is noted for a medium-sized rock that sits by itself on the sand at around 21m. Turning left at 10m is a huge boulder caked in seaweed, starfish, nudibranchs and an array of sea anemones that house various kinds of clown fish. This spot is also full of turtles. 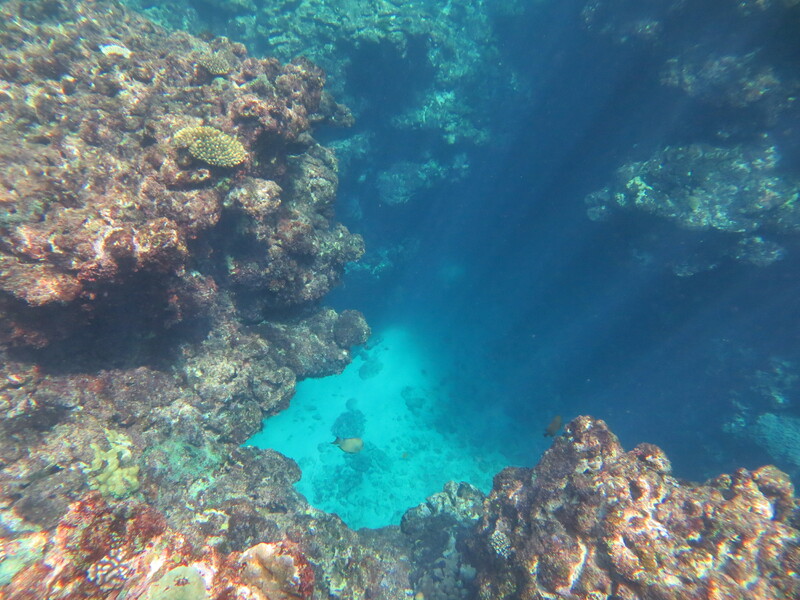 The rock at 21m comes into view after a quick swim across the sand, revealing a riot of activity where divers can get up close to starfish, shrimps, parrotfish, bartail fusiliers, blennies, gobies and butterfly fish hiding in dark crevices or huddling against the small coral formations. A big yellowtail, relaxed and curious, also appeared and followed us for a while before disappearing into the deep blue. 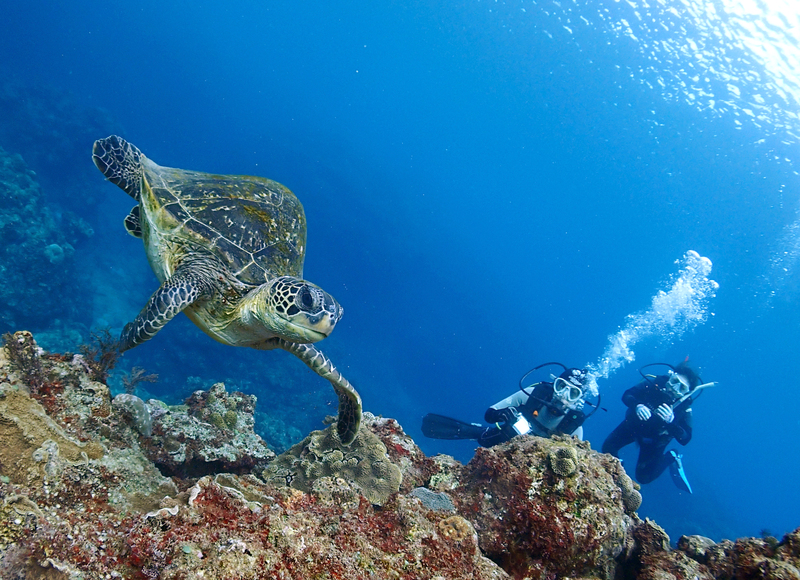 San is also one of many dive spots that are home to the endangered green turban shell. Shiotobiya, only about 10mins away from land, consists of flat, small and medium-sized rocks strewn here and there. At 17m is a sandy patch that is home to the jawfish, a comical and entertaining little creature with a large head, mouth and eyes relative to its elongated body. It constructs burrows, spitting sand at anything that comes too close and curiously peering out to see what’s going on around it. Macro lovers can lie flat and attempt to get some close up shots but this requires excellent timing as the jawfish darts out of sight immediately if it wants to. 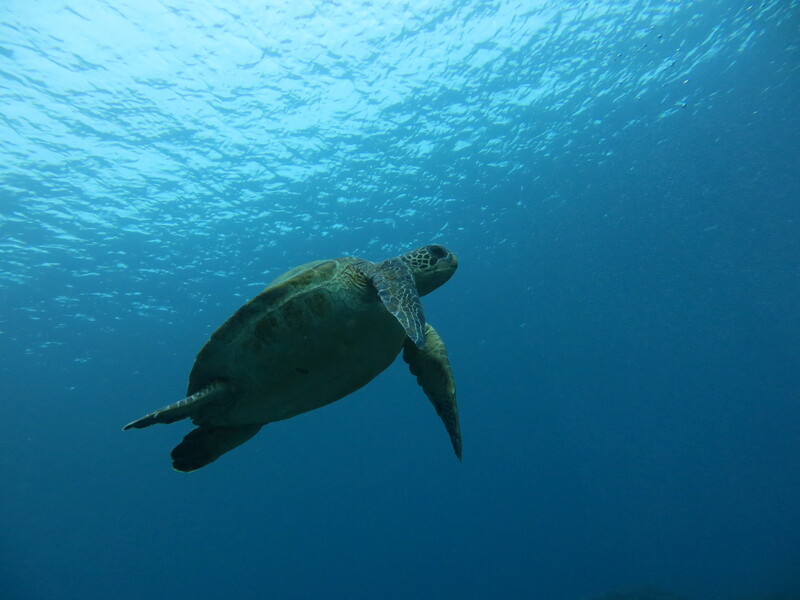 Shiotobiya is also home to Yamachan, Tokunoshima’s famous green sea turtle that’s been around for over 10 years. Tame and relaxed, he is known for his unusual mountain-like shell and is normally found swimming or grazing off the rocks at around 10-15m. As this is a relatively shallow depth, the rest of the dive can be spent in the company of Yamachan, swimming with him and taking photos. Divers don’t often get to visit Tonbara Iwa due to its strong unpredictable currents and location 30mins away in the open sea. However, it is Tokunoshima’s most favourite and challenging point – three small offshore rock islands that are home to large tuna, giant trevally and other pelagic species. Because of the slightly demanding conditions, divers must hold onto an anchor rope as they descend to around 20m. Already the current picks up so most of the dive involves crawling slowly over huge tower-like rocks to a maximum depth of 30m. Sometimes we found ourselves perching on rocks, peering down into the dark blue depths below so this site is not recommended to those with a fear of heights. 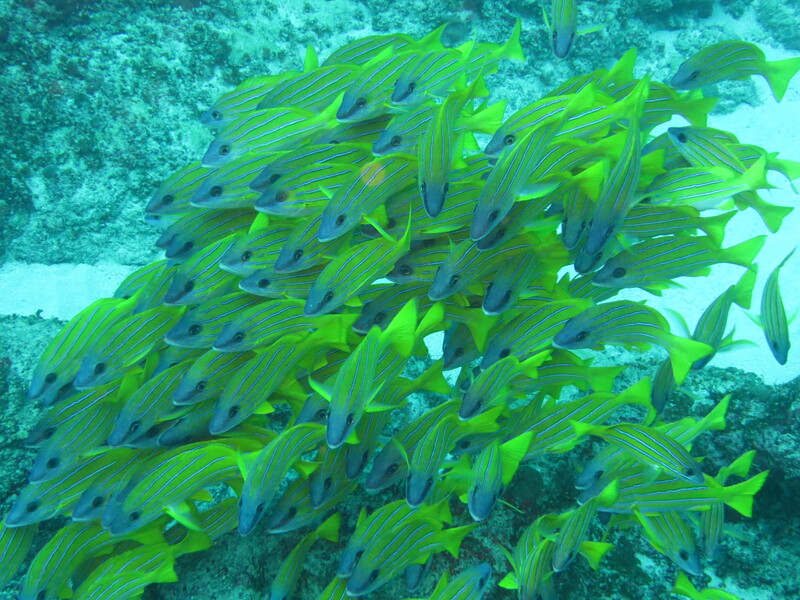 The shallower waters (around 20m) are filled with tropical inhabitants including starfish, redfin fusiliers, white tip reef sharks and large clown triggerfish. Overall this site requires a fair amount of experience and preferably advanced open-water training. I booked the Tokunoshima trip with Paradise Island Tours (http://www.pit-diving.com/travel/). JAL flights to Tokunoshima via Kagoshima leave from Haneda airport at 08:10AM, getting to Kagoshima at 10:10AM, leaving Kagoshima at 10:50AM, arriving at Tokunoshima at 12:00. Return flights to Tokyo via Kagoshima leave at 17:25, arriving at Kagoshima at 18:25, before taking off for Tokyo at 19:10, arriving at 20:40. Other flight times are available. Kamui, the dive school (http://www.ms-kamui.com/) came to pick me up at 13:00. There is a restaurant at the airport which is a good meeting point and lunch spot. Diving equipment can be sent from Tokyo in advance for about 2,500yen It costs 3,000yen to rent a BC, reg and fins set for one day. Kamui is on the opposite side of the island to the airport and the drive from the airport takes approximately 30 mins. The shop is tiny and not much time is spent there as there are other shower and changing facilities depending on the dive sites you are using. The owner of Kamui, Mr Suzuki, speaks English. 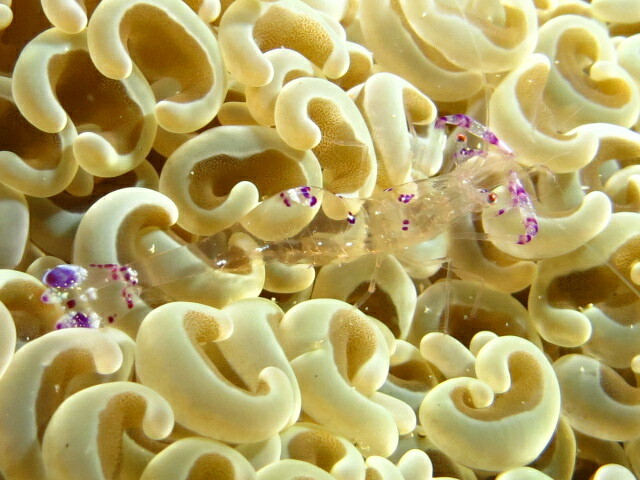 The main site for shore dives is Senma. Nearby are two toilets and two showers (no hot water so the dive school provides a huge tub of it instead) and some steps to lay out gear and set up before walking into the water. It is best to just rinse off as the school will drive you to another facility with 3 showers, hot water, shampoo, conditioner, hair dryer, mirrors, toilet and a machine to dry swimming trunks and bikinis. The dive school’s boat can accommodate 16 people (15 divers and 1 crew). There are no shower or toilets. Divers sit along the sides and set up their equipment on board. There is not much shade so take a hat! Hot tea is provided. All entries into the water are backward rolls. Ascent is via ladder. I stayed at the Hotel Lexton (http://www.nisikawa.net/lexton-t/) which is a comfortable western-style business hotel. Breakfast is available at the restaurant next door called Joyfull. Guests choose either a Western meal (toast, salad, sausages, ham) or a Japanese meal (rice, soup with pork and vegetables) and have unlimited drinks from the drink bar. A short walk from the hotel is a small area called Kametsu with a sushi bar (with conveyor belt), a range of Japanese-style pubs (izakaya) and a couple of supermarkets. The total cost of the trip was about 93,400yen, including return flight, 2 boat dives per day including tanks and weights, 3 nights’ hotel stay with breakfast and all transport to and from the dive sites and school. Dive 1: Senma: depth: 17.2m, average depth: 8.9m, dive time: 42 mins, water temp: 22C, used a 10L steel tank, 5mm wetsuit, 3mm hood/vest and 4kg weight belt (no back plate). Start pressure: 195 bar, end pressure: 70 bar. Saw cuttlefish, a few green sea turtles and a huge sea snail. Dive 2: Blue Hole Oki: depth: 24.1m, average depth: 11.8m, dive time: 41mins, water temp: 21C, used a 10L steel tank, 5mm wetsuit, 3mm hood/vest and 4kg weight belt (no back plate). Start pressure: 195 bar, end pressure: 70 bar. Saw a school of bluestripe snappers, yellowfin goatfish, green sea turtles, cuttlefish, whitetip reef shark and nudibranchs (phyllidiopsis fissuratus and chromodoris colemani). Dive 3: San: depth: 10m, average depth: 6.8m, dive time: 42mins, water temp: 21C, used a 10L steel tank, 5mm wetsuit, 3mm hood/vest and 4kg weight belt (no back plate). Start pressure: 200 bar, end pressure: 50bar. 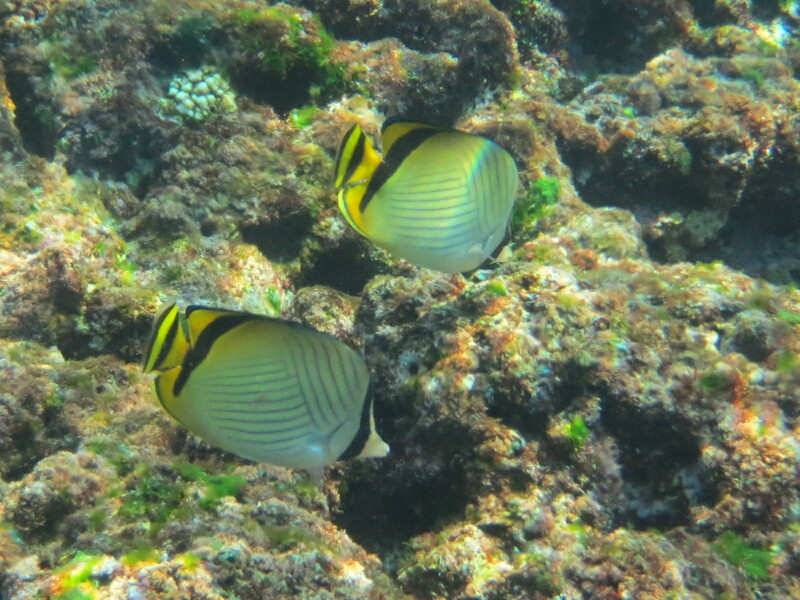 Saw green sea turtles, clown anemone fish, great green turban, bartail fusiliers, purple queens, stout chromis. Dive 4: Shiotobiya: depth: 19.8m, average depth: 10.1m, dive time: 44mins, water temp: 21C, used a 10L steel tank, 5mm wetsuit, 3mm hood/vest and 4kg weight belt (no back plate). Start pressure: 190 bar, end pressure: 70 bar. 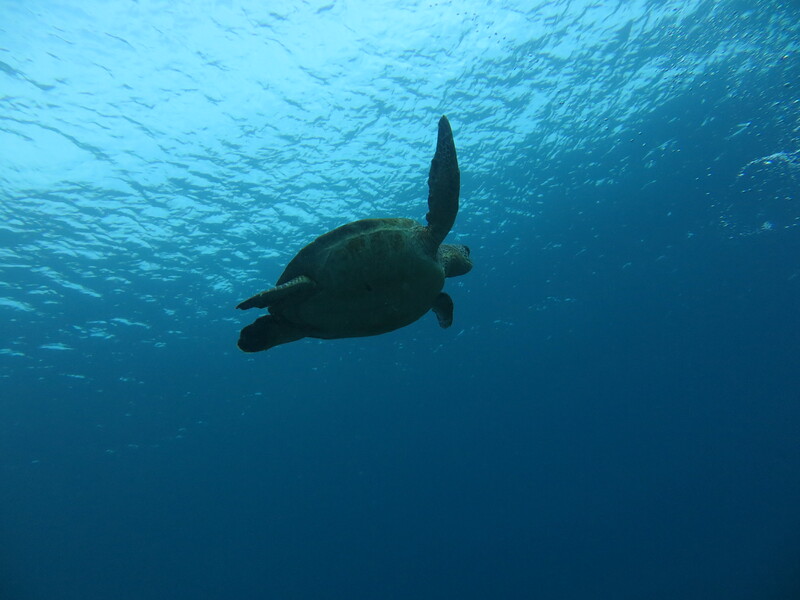 Saw green sea turtles (Yama-chan), jaw fish, black banded sea snake, heard whale cries and bartail fusiliers. Dive 5: Tonbara Iwa: depth: 25m, average depth: 13-14m, dive time: 40mins, water temp: 22C, used a 10L steel tank, 5mm wetsuit, 3mm hood/vest and 4kg weight belt (no back plate). Start pressure: 210bar, end pressure: 70 bar. Saw white tip reef shark, giant trevallies, sea snakes, starfish, redfin fusiliers and yellowtail. Dive 6: San: depth: 21m, average depth: 10m, dive time: 45mins, water temp: 22C, used a 10L steel tank, 5mm wetsuit, 3mm hood/vest and 4kg weight belt (no back plate). Start pressure: 210 bar, end pressure: 70 bar. Saw green sea turtles, yellowtail, purple queens, clown anemone fish. Dive 7: Shiotobiya: depth: 19m, average depth: 8m, dive time: 40mins, water temp: 21C, used a 10L steel tank, 5mm wetsuit, 3mm hood/vest and 4kg weight belt (no back plate). Start pressure: 200 bar, end pressure: 80 bar. Saw green sea turtles, jaw fish, a beautiful transparent purple shrimp and clown fish. Based in Bristol, UK, I am a freelance writer and consultant working on Japan’s aquaculture and fisheries development. My work focuses on issues related to sustainability, research, gender, technological advancements, adaptation and resilience. I have a keen interest in the recovery of aquaculture in the Tohoku region, following the Great East Japan Earthquake and Tsunami of March 11th, 2011, and provide news stories, features and reports from Japan for national and international seafood and fisheries media. While living in Tokyo between 2006 and 2017, I worked as a freelance writer on Japan’s aquaculture and marine-related subjects, in particular scuba diving. 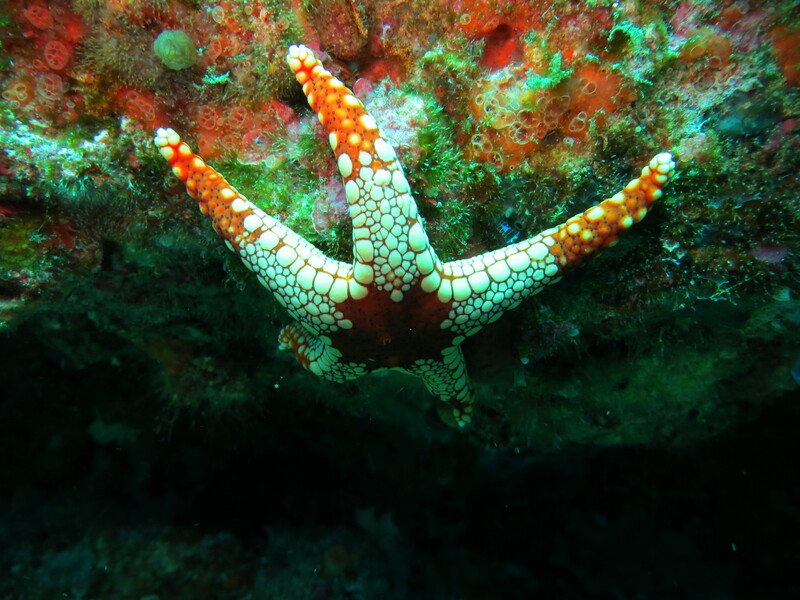 My blog began in 2011 as a comprehensive guide to diving in Japan. I have enjoyed exploring Japan’s waters extensively and became a certified Dive Master in August 2015. I hold an MSc in Sustainable Aquaculture from the University of St Andrews, and a BA in Japanese and French from the University of Cardiff, UK.